My new neice, Mikayla was born at 3:17 am on September 28th. She was 7lbs 12 ounces and 20 3/4 inches. She is so precious, just like a little doll. 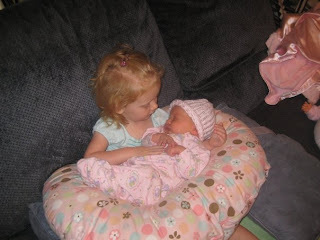 She has a quiet cry and the sweetest little button nose, just like her big sister Aubrey (who is now 2). They are the cutest little family and I love them so much! We will miss them when they move to Texas in a couple of months. Other than that...same old same old! Michael continues to work 3-4 days a week (12 hour shifts) and I have been putting a few more hours a week in at my job. We are anxious to get him into the academy (crossing our fingers for Nov. 30!) and then we can get a move on with the house hunting again. With the holidays just around the corner I am getting more and more excited! This will be our first holiday season out on our own even though we have been married almost two years now! I can't wait to get some much needed holiday decorations (if you have any you don't want anymore- we take donations! ;-) ) and spruce up the place with some holiday cheer!! I love the holidays!! I'm sooo looking forward to using our fireplace, putting up a Christmas tree, stockings, lights...ah...yay! Don't you just love life? !